Here is a handpicked collection of the top food WordPress themes, and the best part about these themes is that they are free! Whether you’re a food blogger, own a restaurant, cafe or bakery, or enjoy making delicious recipes, you will find something in this roundup to fit your needs. These themes have all been designed with the purpose of showing off food with large images and other features that are ideal for restaurants, cafes, and other food establishments. There are many that are designed with specific types of food in mind, some more general food blog-style ones, which would be perfect for showing off your latest delicious creations. 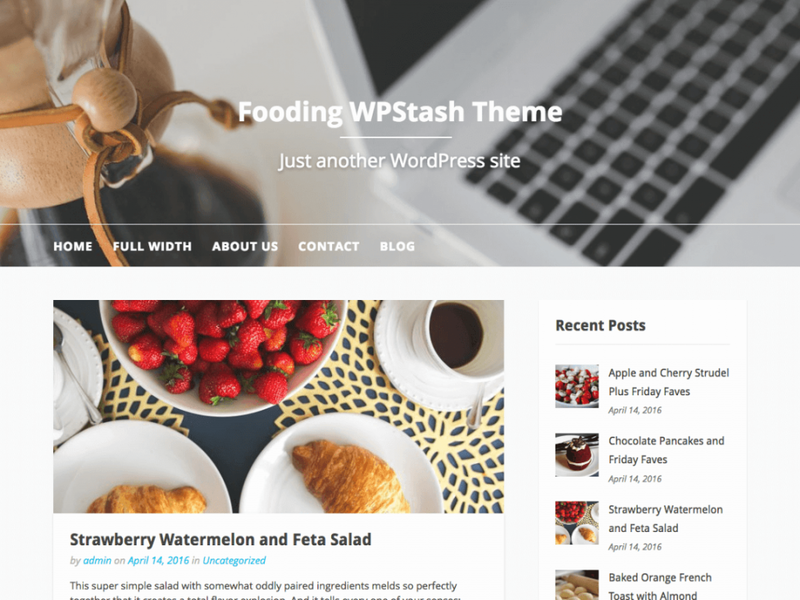 Check out over 40 of these free food WordPress themes below! 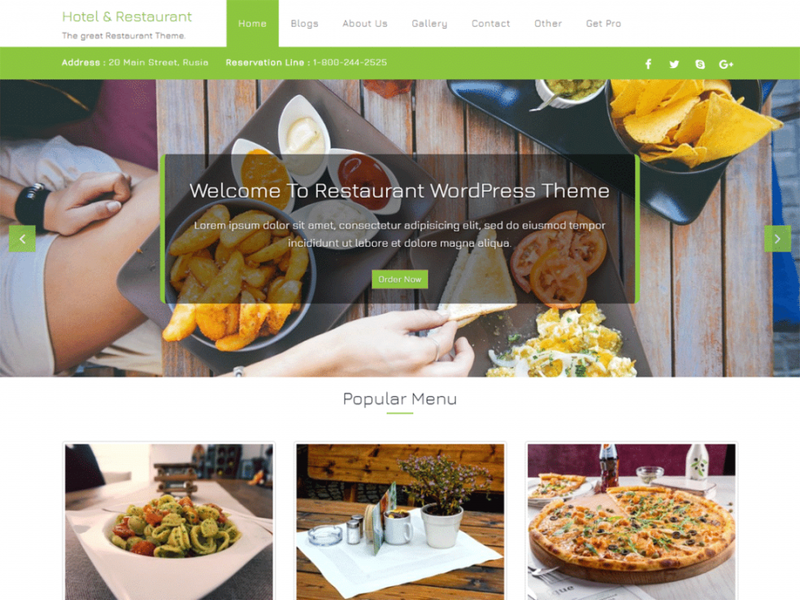 Best Restaurant is a clean and modern WordPress theme that is ideal for restaurants, cafes, bakeries, fast food places, and any other food-related businesses. This theme is very easy to install and customize, making it perfect for those that don’t have any coding experience. Some great features of Best Restaurant include a full-screen image banner, an About Us section, Service section, Recent Post section, and a Contact Us form. VW Bakery is an attractive and colorful, feminine-looking WordPress theme ideal for a bakery, cafe, coffee or pastry shop. This theme is multipurpose and can also be used for food blogging. By changing the color scheme from light and colorful to dark and bold, it makes the perfect theme for a bar, pub, or nightclub. With several different customization options, you can truly make this theme your own. Social media icons are integrated with the theme to make sharing your bakery with every household easy. 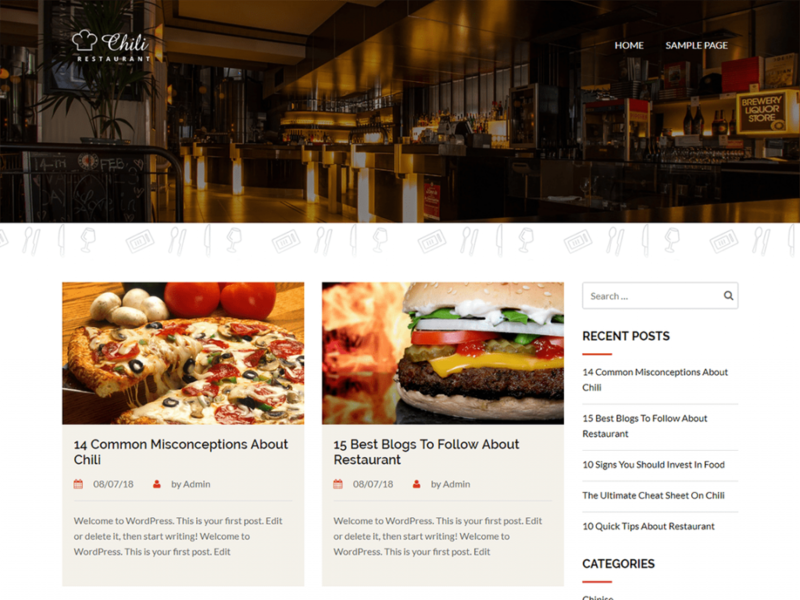 Foodie Blog is a simple WordPress theme designed to be a restaurant-review site or food blog. It is ideal for bloggers, newspapers, writers, or journalists who have websites. With its minimalist design, all of the focus is on your content. The sidebar and header widgets are perfect for displaying ads or affiliate links, making monetizing your website or blog easy. Everything is completely customizable, so once you have your site to your liking, you can get started writing and posting images on recipes, dining, restaurant reviews, or whatever you’d please. 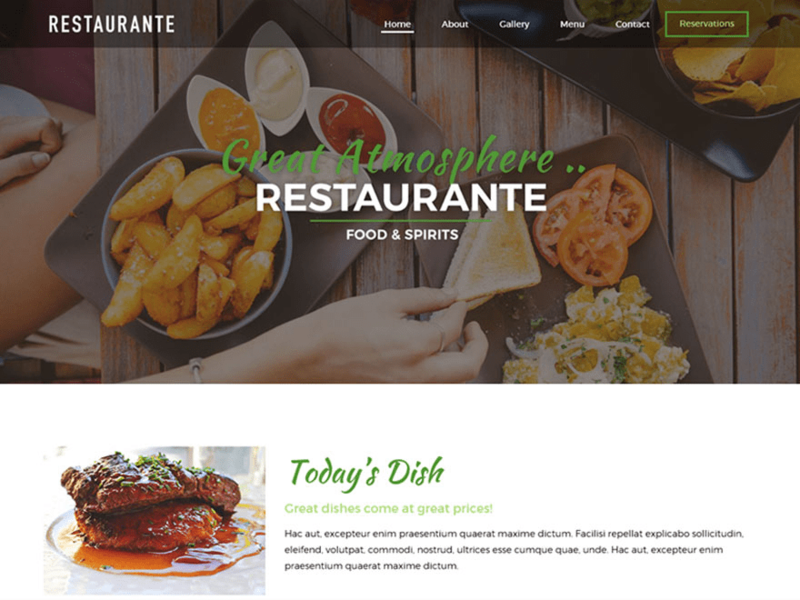 Restaurante is a lightweight, attractive WordPress theme for restaurants, fast food chains, grill n pubs, or any other food-related business. Some key features of this theme include the ability to upload your own logo/favicon, a customizable background, header, and shortcodes. It is SEO friendly, which makes it easy for you to be found in the search engines. 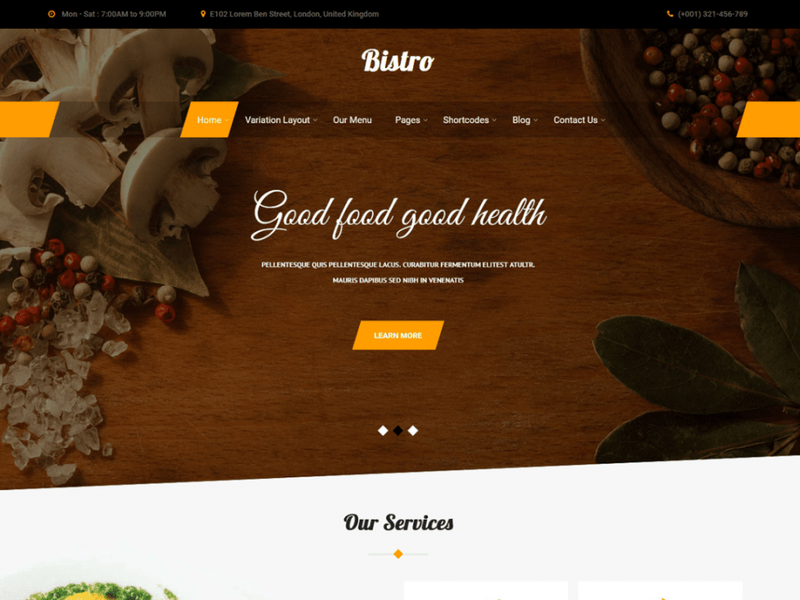 Bistro Lite is a multipurpose WordPress theme ideal for chefs, restaurants, coffee shops, caterers, food delivery services, or any other food-related businesses. This theme is compatible with many different recipe plugins, so all of your recipes can be showcased with ease. Bistro Lite also comes WooCommerce ready so that booking tables is a breeze. This free theme is packed with features. 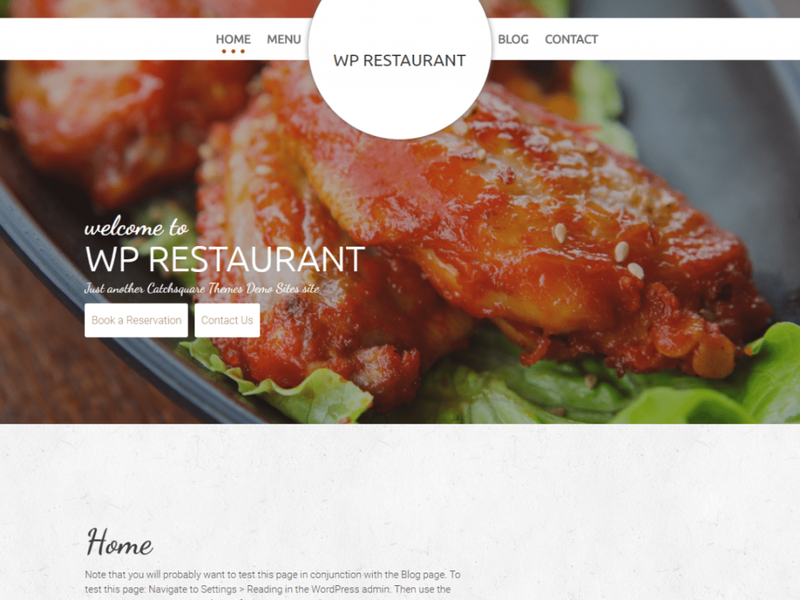 WP Restaurant is an attractive, professional WordPress theme perfect for restaurants, cafes, and any food business. This theme comes with a huge featured image slider on the homepage to showcase your delicious creations. With all of the customizable options, you can easily make your site your own. WP Restaurant is fully responsive, ensuring that your site looks great across all devices. 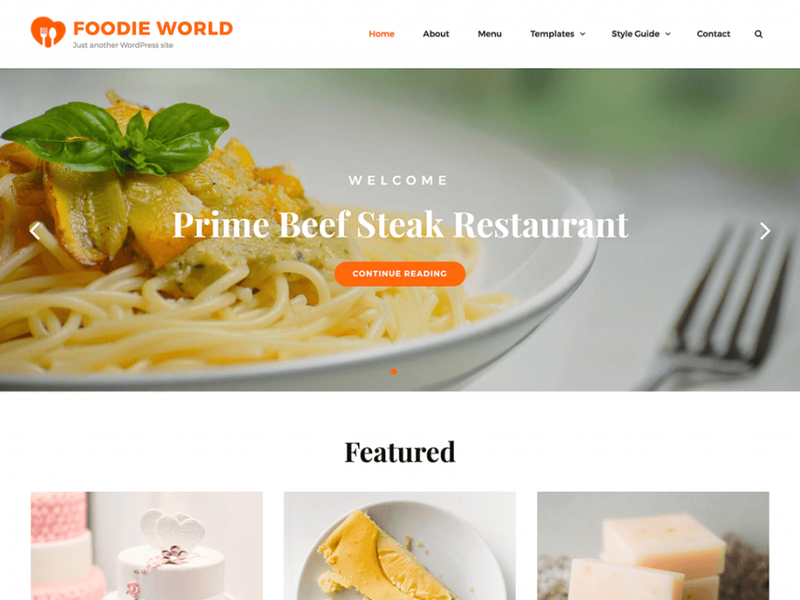 Foodie World is a free restaurant WordPress theme where you can easily showcase your menu and delicious recipes. With its minimalist design, all of the focus is on your content. Foodie World has an attractive and engaging appearance with simple menu pages. If you’re looking for a fresh theme that can show off your website and everything it has to offer, this is the theme for you. 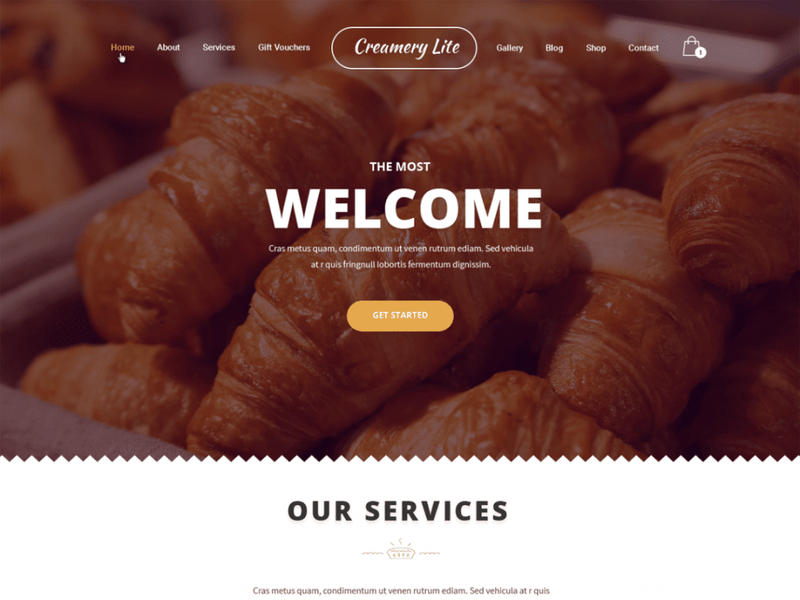 Creamery Lite is a free food and bakery WordPress theme that can be used to showcase your cakes, cookies, pies, sandwiches, and pretty much anything that you have to serve up. Creamery Lite was designed for many different food-related businesses. This theme supports drag-and-drop page builders such as Divi or Elementor so that building your site is a breeze. It also features WooCommerce support so that you can set up an online store. This theme is jam-packed with features without a heavy price tag. 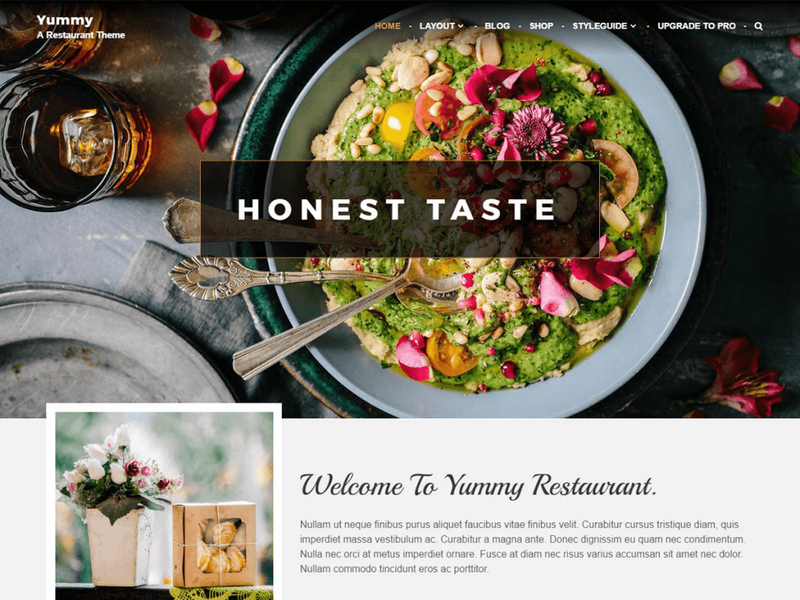 Yummy is a free restaurant WordPress theme perfect for selling delicious food and drinks online. It is fully customizable and everything from the background and color scheme can be changed to suit your needs. Key features of Yummy include multiple layout options, several useful widgets, and it is WooCommerce compatible so that making money is easy. This theme is highly recommended. Hotel and Restaurant is a WordPress theme specialized in high-quality food and service. 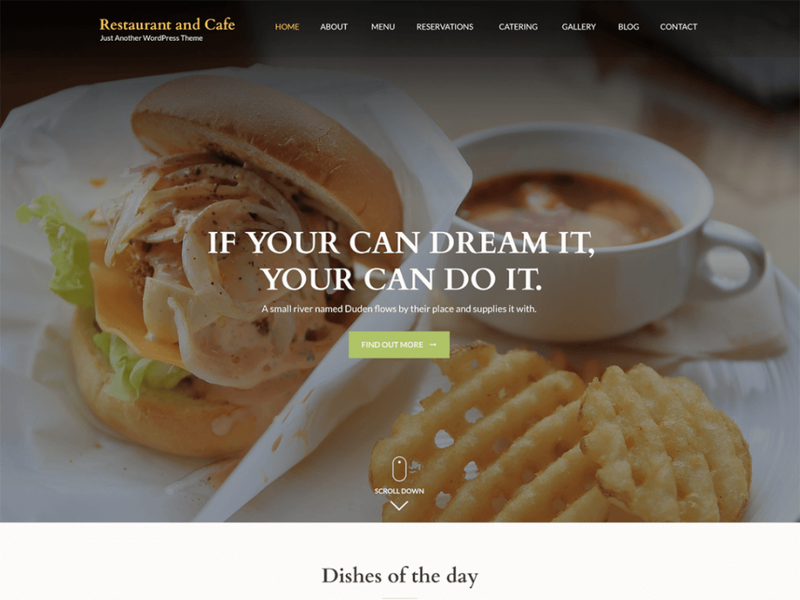 This is a clean and professional-looking theme ideal for hotels, restaurants, bakeries, and other dining-related businesses. This theme is fully responsive so that your content and images look beautiful on all devices. Features include a blog section, an About Us page, a Contact Form and homepage slider. You can’t go wrong with Hotel and Restaurant. 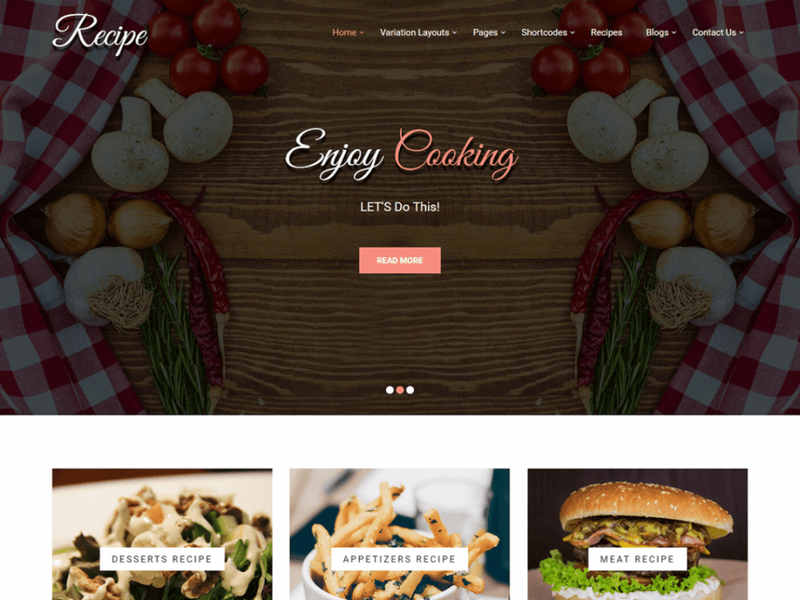 Recipe Lite is a free, high-quality WordPress theme ideal for restaurant and bistro owners, food bloggers, cafes, coffee shops, and more. 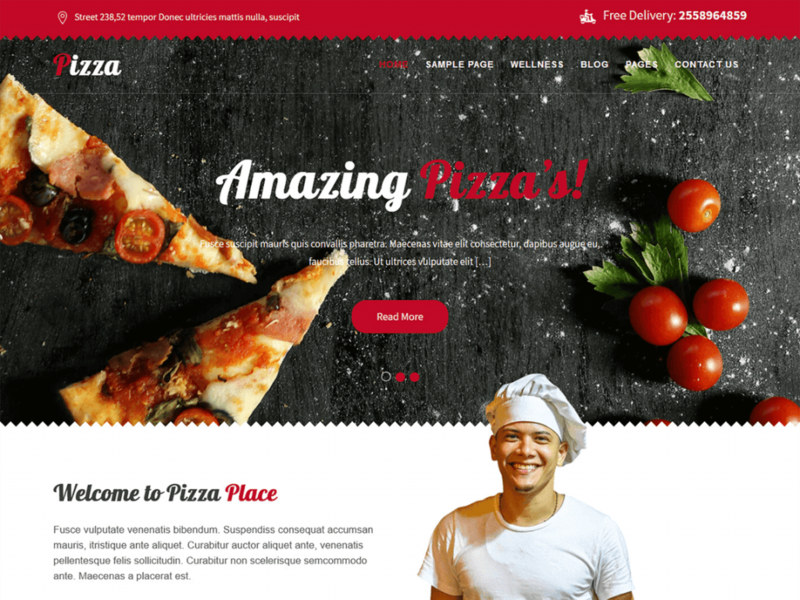 Food and pizza delivery services can also use this multipurpose theme and easily make use of the WooCommerce integration for online ordering. This theme is fully customizable, 100% responsive, and translation-ready for those users who speak different languages. 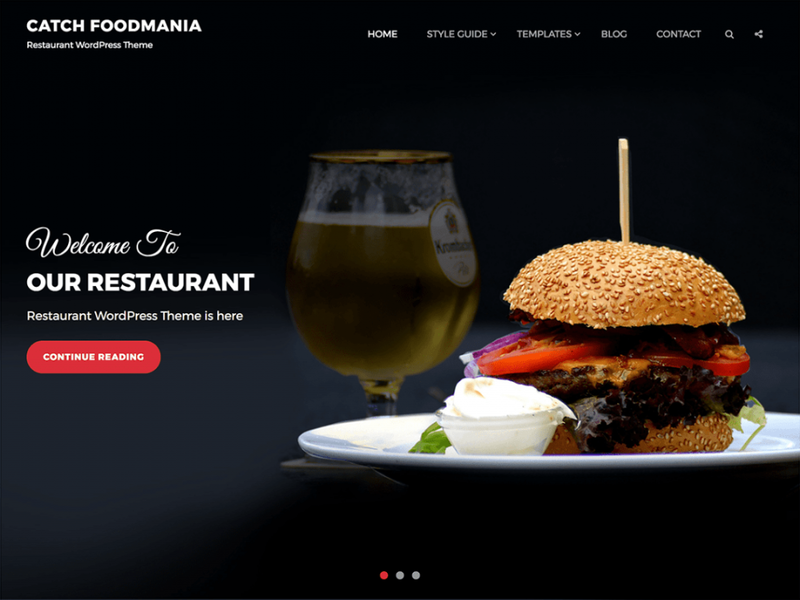 Catch Foodmania is a simple, yet highly customizable restaurant WordPress theme that puts your delicious creations front and center. Some unique features of this theme include header media, featured content, featured sliders, food menus, testimonials, and more. Catch Foodmania is a great free theme to get your restaurant business off the ground. 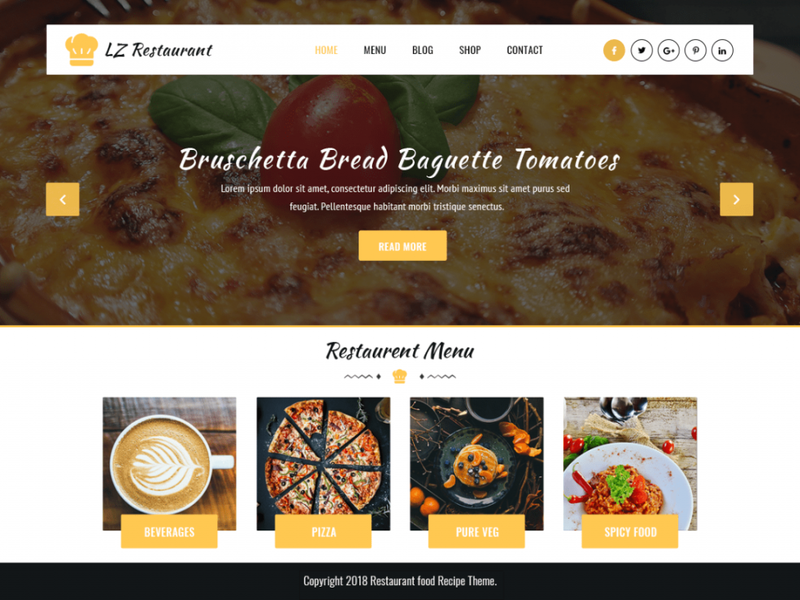 LZ Restaurant is a multipurpose WordPress theme ideal for displaying dishes and recipes from restaurants, cafes, bakeries, fast food places, and other eateries. This theme comes with several customizable options so that you can truly make your site your own. Features of this theme include a testimonial section, a huge front page call-to-action button, and built-in social media sharing icons. This free theme is worth checking out. 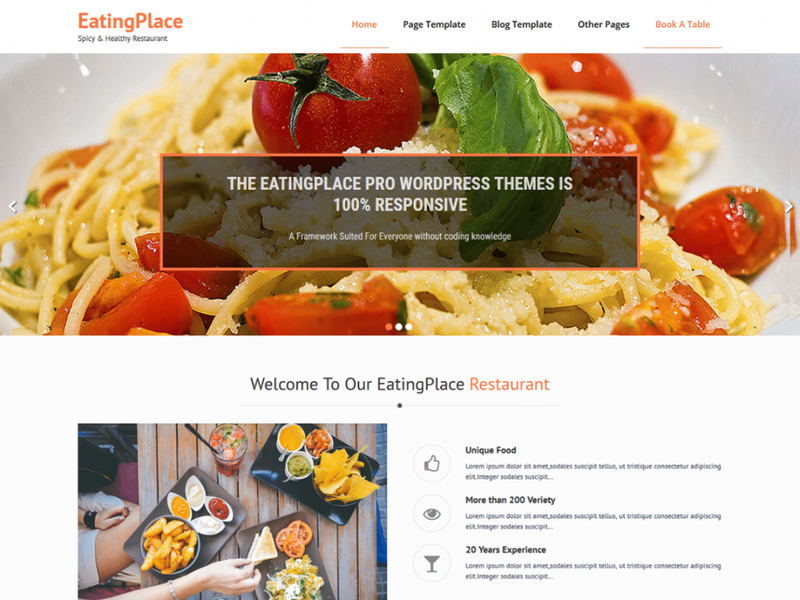 EatingPlace is a simple and clean WordPress theme perfect for restaurants, cafes, bakeries, pizza parlors, and mostly any food businesses. This responsive layout makes your content and images look great across all devices. With its clean food menu, simple integrated contact form, and photo gallery, this free theme has all the bells and whistles that a premium theme has. 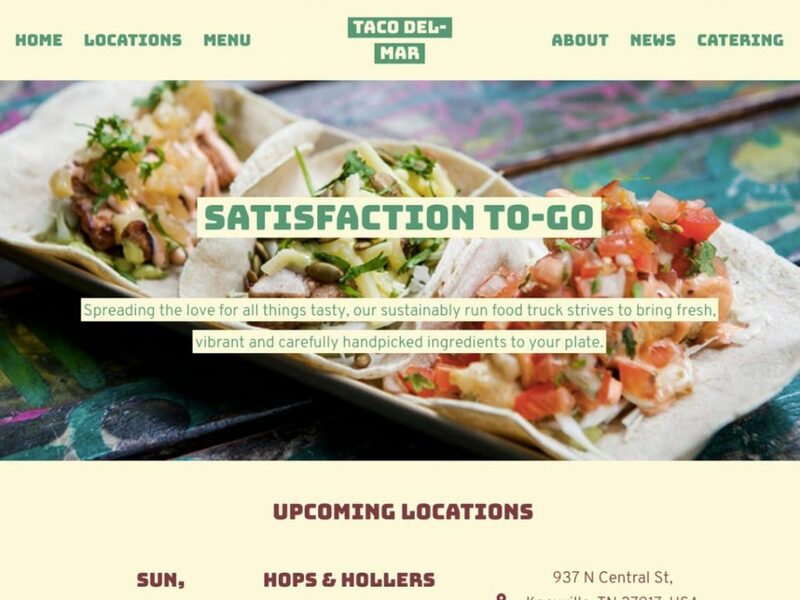 Food Truck is a free theme intended for food trucks and mobile street food operators. This theme is fully customizable, allowing you to customize colors, fonts, logo, banner, and more. Food Truck is highly responsive to ensure that your site looks its best across all devices. This simple theme is worth checking out. Food Restaurant is a professional-looking, multipurpose WordPress theme ideal for restaurants, cafes, coffee shops, fast food places, and any food-related businesses. This theme is WooCommerce ready and fully responsive so that it looks appealing across all devices. Food Restaurant has nice, big call-to-action buttons displayed over attractive banners. It also comes with unique social media integrations, so that sharing your content across different social media platforms is easy. This theme is packed with all the features of a premium theme without the price tag. 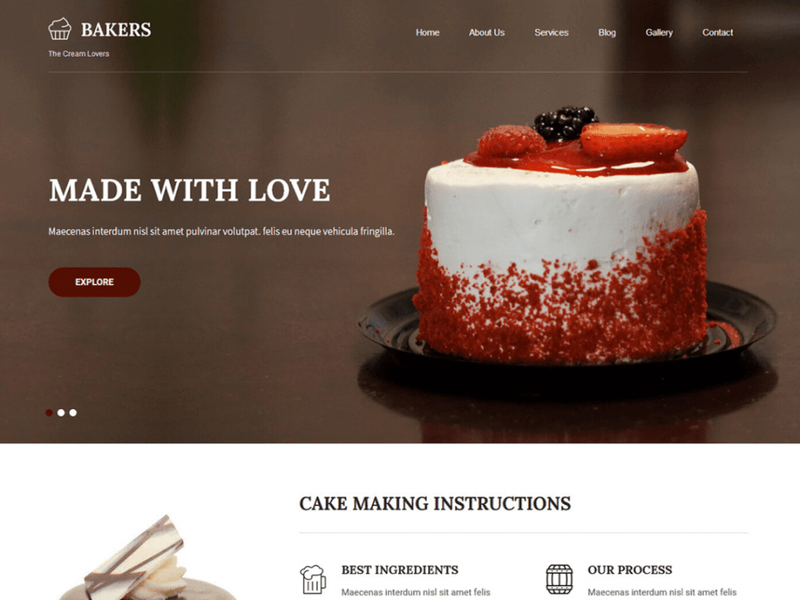 Bakers Lite is a clean, free WordPress theme ideal for bakeries, pastry shops, coffee shops, eateries, and other food-related businesses. This theme comes with WooCommerce integration so that selling your cakes and goodies online is a breeze. It is fully customizable, so you have the option of changing colors, backgrounds, and fonts. This theme is fast loading, easy to install, and worth checking out. Fooding is a clean and minimalist theme ideal for food bloggers and those who want to share recipes. It is a feature-packed theme that is super easy to install. Everything is customizable, so changing colors, backgrounds, and fonts is a breeze. There is an About Us section, a contact form, and sidebar widgets. If you’re a food blogger, this theme is recommended. 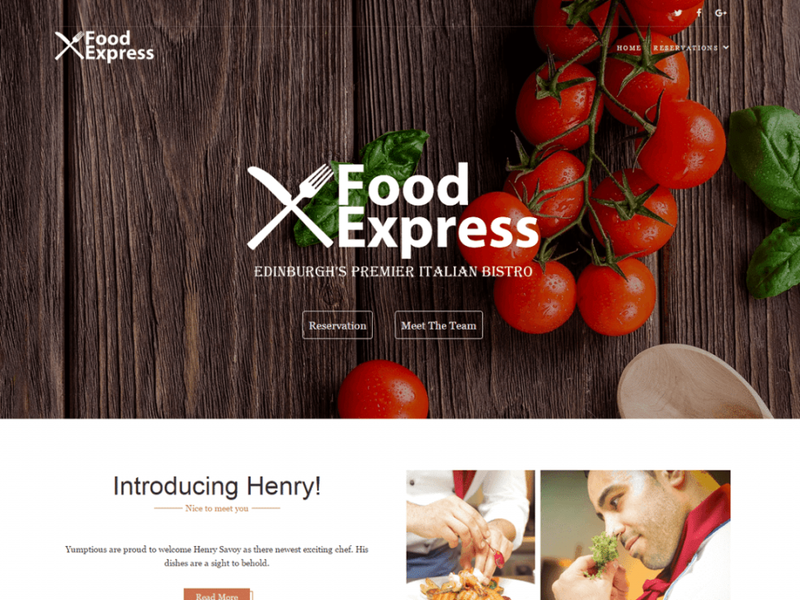 Food Express is a modern and clean WordPress theme catering to small food-based businesses. This theme is fully customizable and comes with WordPress customizer, allowing you to change colors, fonts, and backgrounds without needing any coding experience. Food Express is 100% responsive, ensuring that your content looks its best on all devices. 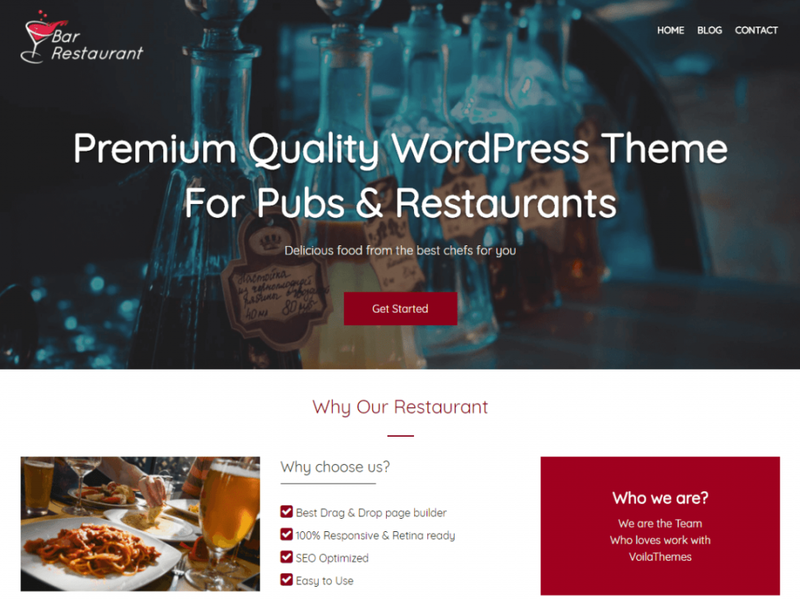 Bar Restaurant is a high-quality WordPress theme perfect for restaurants, bars, pubs, and more. This theme can be easily customized to change all colors, fonts, and backgrounds so that you can make it your own. There is a blog section and contact form so that your customers can connect with you easily. Bar Restaurant is fully responsive so that your website looks top notch no matter what device it’s being viewed from. MH FoodMagazine is a nice, fresh WordPress theme suitable for delicious food magazines and editorial websites in the health and fitness niche. Some key features of this theme include multiple unique custom widgets, extended layout options, and the ability to change all colors, backgrounds, and fonts. MH FoodMagazine is fully responsive and translation ready to cater to those customers who speak different languages. 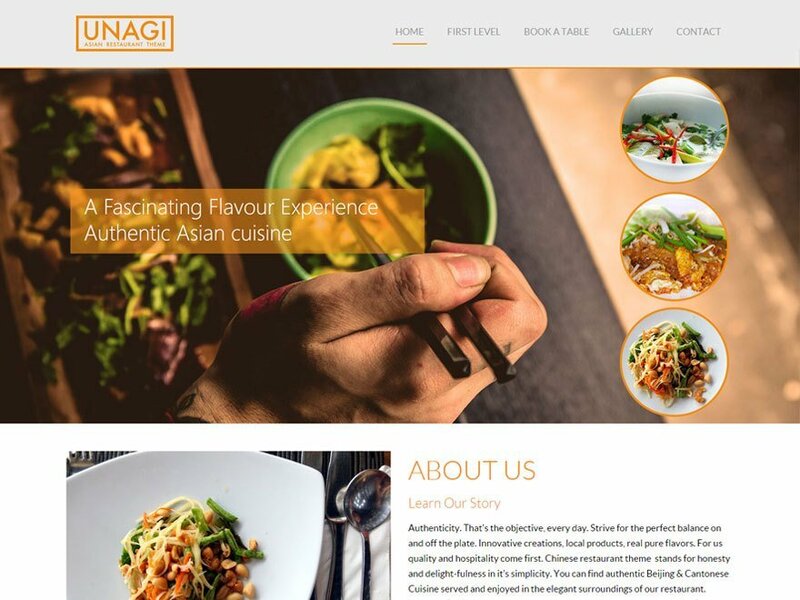 Chinese Restaurant is a WordPress theme ideal for Japanese, Chinese, Korean, Thai restaurants, and sushi bars. 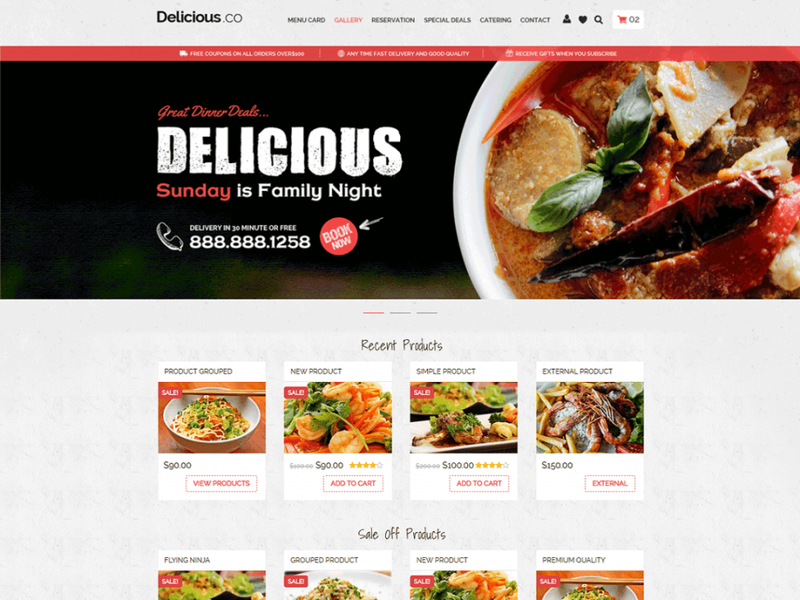 This multipurpose theme could also be used for any other type of restaurant, as well as a recipe site. This theme gives you the option of customizing colors, uploading your own logo/favicon, and has the ability for customers to book a table right from your site. This is a free restaurant theme that is worth checking out. 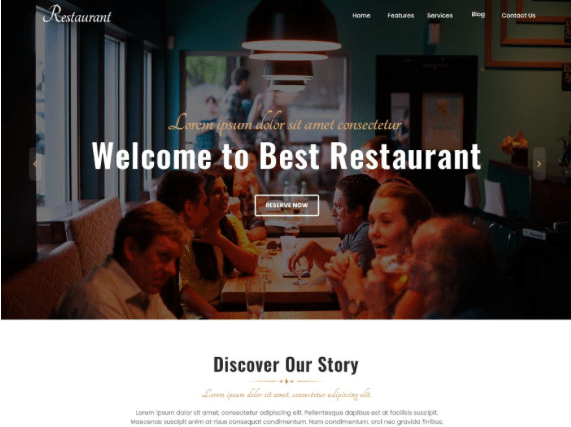 FoodHunt is a modern and attractive WordPress theme ideal for restaurants and pizzerias. However, due to its flexibility and customization options, it can be used for a variety of different sites. There’s a food menu section, so that customers can view all of the items that you offer. This really helps attract food lovers right to your site. FoodHunt is completely responsive to ensure that your website looks its best across all devices. Restaurant and Cafe is the perfect solution for restaurants, cafes, or any food and drink-related businesses. Whether you own a coffee shop, bakery, or upscale restaurant, this theme will suit your needs. This theme comes with features such as a banner section, About Us section, testimonial section, reservation and blog section. Restaurant and Cafe also supports WooCommerce, so that online ordering is a breeze. 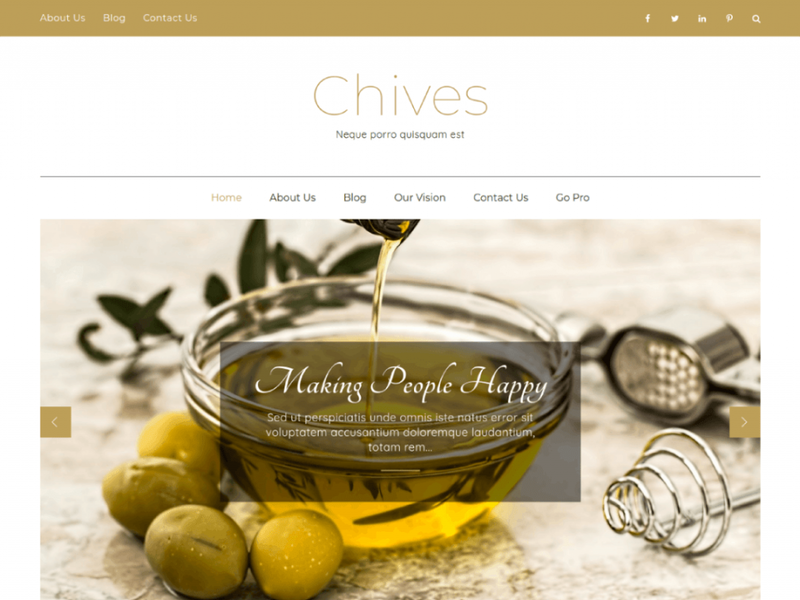 Chives is a clean, elegant, and responsive WordPress theme ideal for food blogs and recipe sites. This theme has a ton of unique features such as front page customizable sections, multiple layout options, and a blog section. Chives also comes with a social media widget making it easy for customers to follow you across all social media platforms. This is a free theme definitely worth looking at. Chili Lite is an attractive WordPress theme ideal for restaurants, cafes, bakeries, pastry shops, and more. This theme has a clean, one page, minimal design that is 100% responsive. It comes with social media plugins so that sharing your content across all social media platforms is easy. Chili Lite is fully customizable so that you can make your site your own. This is a premium theme without a premium price tag. VW Restaurant Lite is the perfect solution for hotel and food service businesses. It is ideal for food bloggers, eateries, hospitality businesses, bakeries, and cafes. This attractive, professional, and fully responsive WordPress theme has various shortcodes and customization options so that you can make your site your own. It has a built-in testimonial section so that customers and clients can leave feedback on how much they appreciate your service. This free theme is jam-packed with features and is worth checking out. 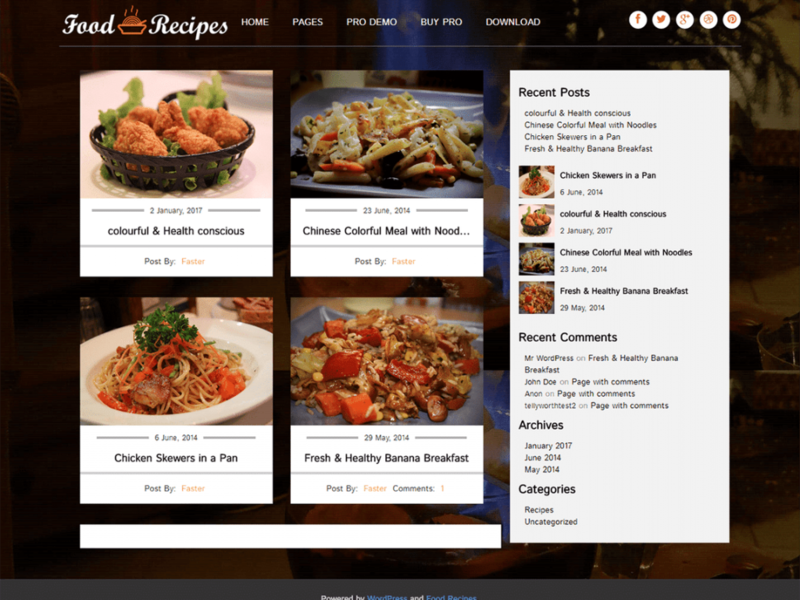 Food Recipes is a clean, attractive WordPress theme ideal for food bloggers and those interested in sharing their yummy recipes. This theme comes with a recent post section, a comments section, and categories section. It is 100% responsive so that your images and content looks great on all devices. This simple, free theme is a great option for bloggers. 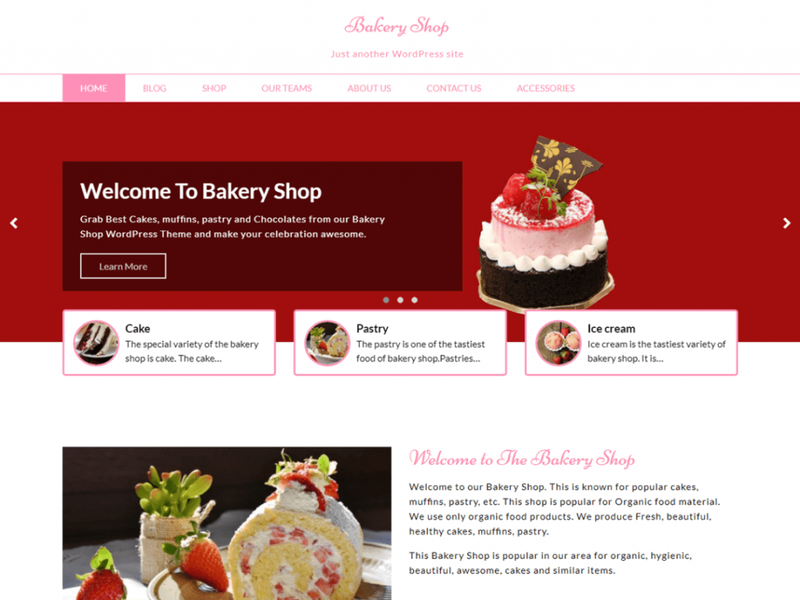 Bakery Shop is a multipurpose WordPress theme ideal for bakeries, pastry shops, cafes, coffee shops, and food bloggers. This theme comes with an About Us page, a contact form, and a shop tab so that selling goodies is a breeze. 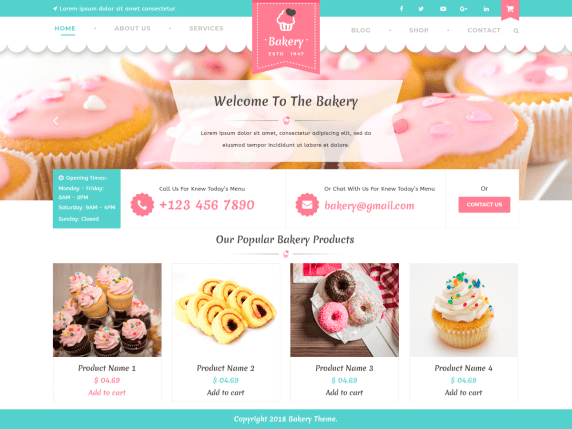 Bakery Shop has multiple homepage layouts, is 100% responsive and translation ready. This attractive theme is worth checking out. 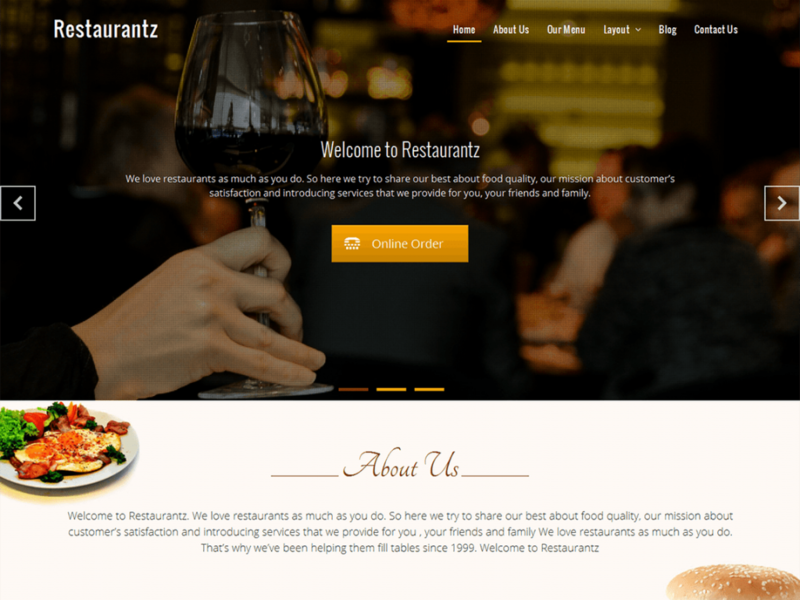 Restaurantz is a clean and modern WordPress theme ideal for restaurants, cafes, coffee shops, and any other food-related businesses. This theme is easy to install and fully customizable so that you can make your site your own. There is multiple layout options, a blog section, and contact page. This 100% responsive theme doesn’t disappoint. 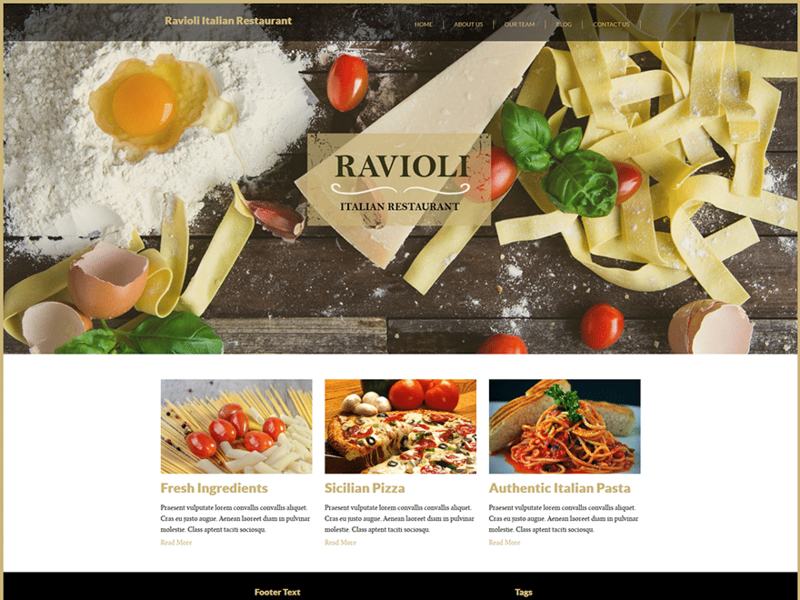 Pizza Lite is a beautiful, professional-looking WordPress theme suitable for restaurants, fast food places, pizza delivery services, and online ordering businesses. This theme is WooCommerce compatible so that online ordering can be done with ease. Pizza Lite also comes with a blog section and contact page. This theme can be customized to your liking. If you’re looking for a theme that is going to make you look like a pro in the food industry, this free theme is the one. 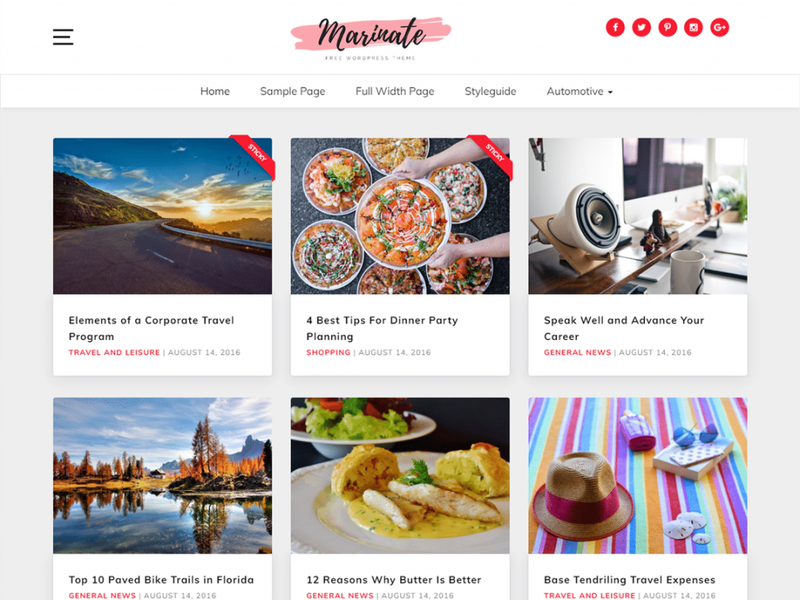 Marinate is a simple and minimalist WordPress theme ideal for food bloggers, photographers, and anyone wanting to showcase a portfolio. This theme comes with a grid-like layout for its homepage and full-width featured image for single posts, which is ideal for showing off high-resolution photos. 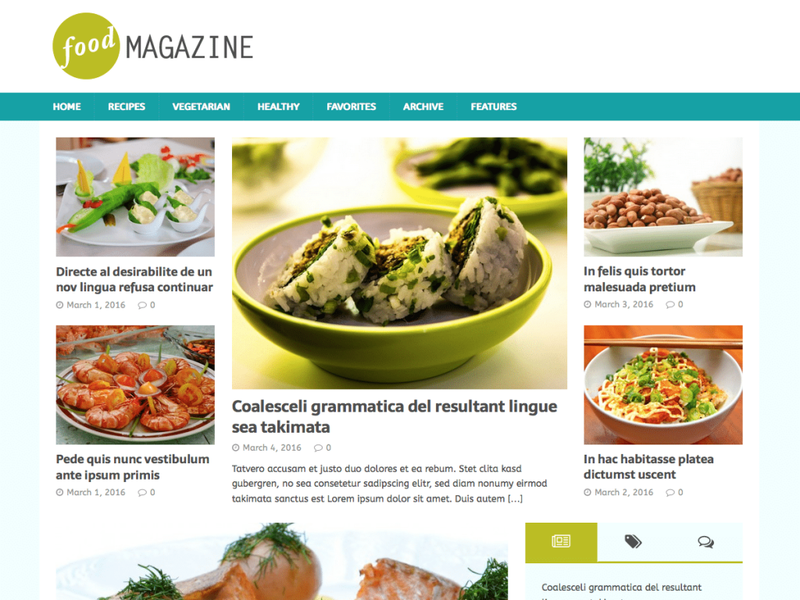 If you are into sharing recipes, this theme is highly responsive, so that your content looks great on all devices. Marinate is the perfect theme for food bloggers wanting a clean look and feel. 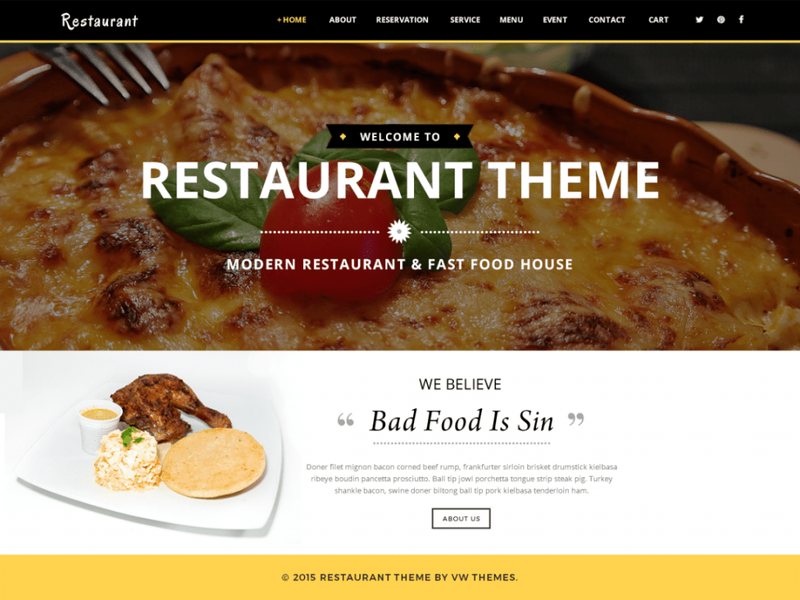 Restaurant PT is a simple, one-page WordPress theme ideal for restaurants, cafes, coffee shops, and pizzerias. With an About section, blog section, and bookings section, there is much for your customers to see and do on your site. 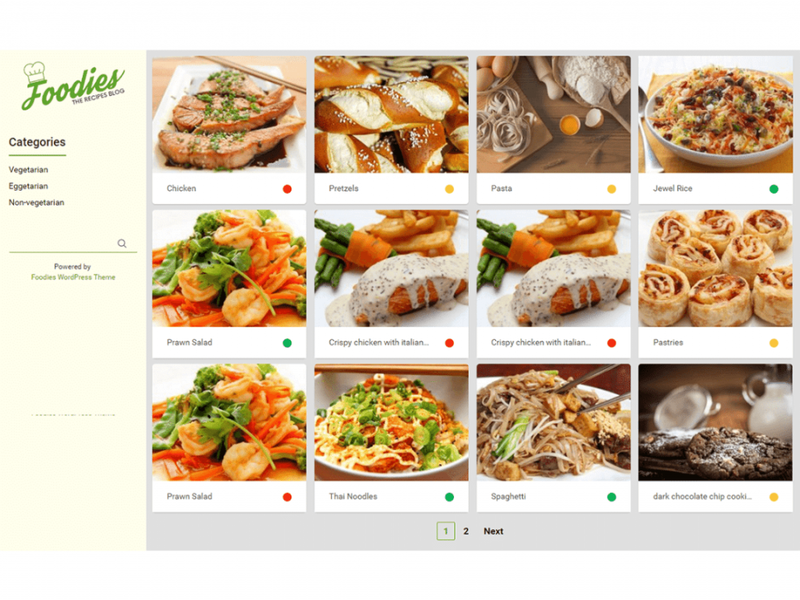 You can easily showcase your delicious dishes or easy recipes with the menu feature. Restaurant PT is easy to install and looks great on any device. 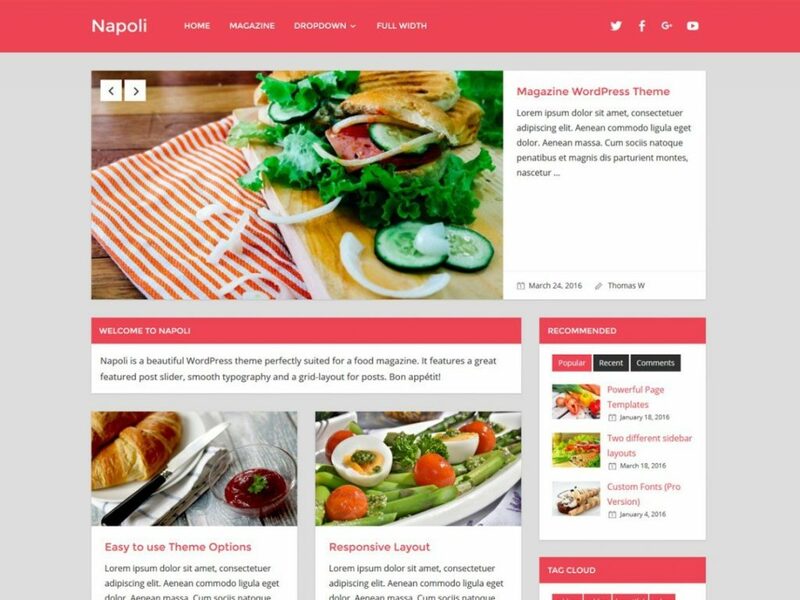 Napoli is a beautiful WordPress theme ideal for a food blog or magazine. Some key features of this theme include a featured post slider, grid layout for posts, a recent posts section, and plenty of space for ads. Whether you are showcasing food pictures or recipes, it will look amazing with this attractive theme. Napoli is 100% responsive to ensure your site looks great on any device. 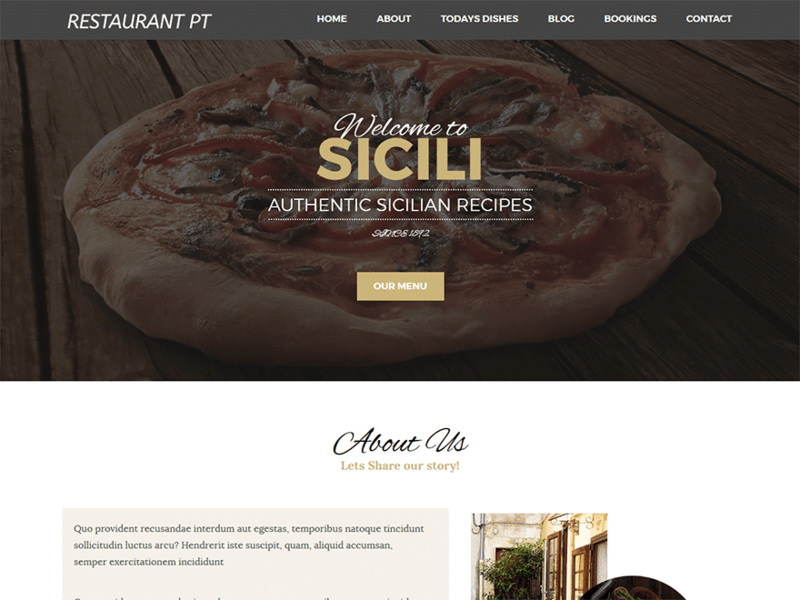 Italian Restaurant is a modern and stylish WordPress theme ideal for restaurants and other food-related businesses. Some of its features include custom menus, header, customizer panel, and full-width pages. Italian Restaurant also has a blog section, so showing off your recipes and yummy dishes is easy. This theme is 100% responsive and translation ready for those visitors who speak a different language. 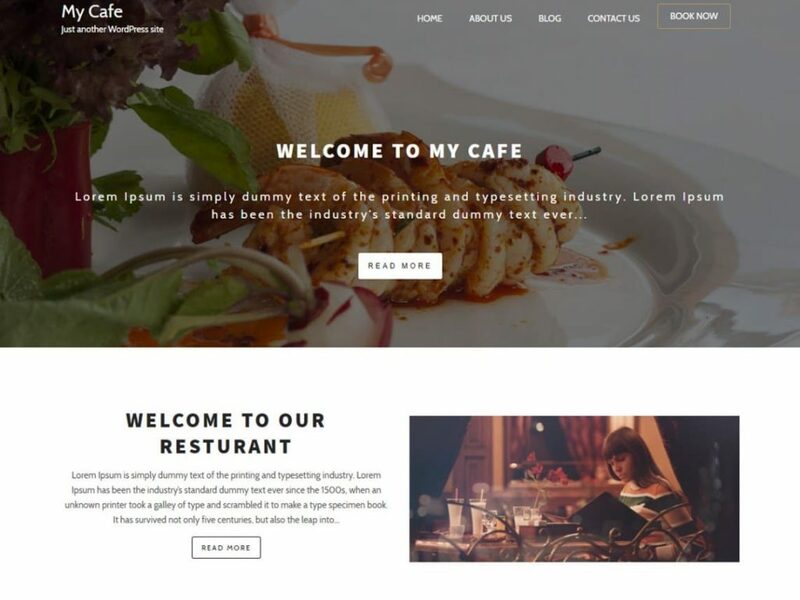 My Cafe is a stylish, multipurpose WordPress theme suitable for restaurants, cafes, bars, and pubs. This theme comes with several customization options perfect for making your site your own. There is an About section, a contact section, and blog section. This is the perfect theme for showing off your menu, recipes, and delicious dishes. Plus, it is 100% responsive to ensure that all content looks great on all devices. 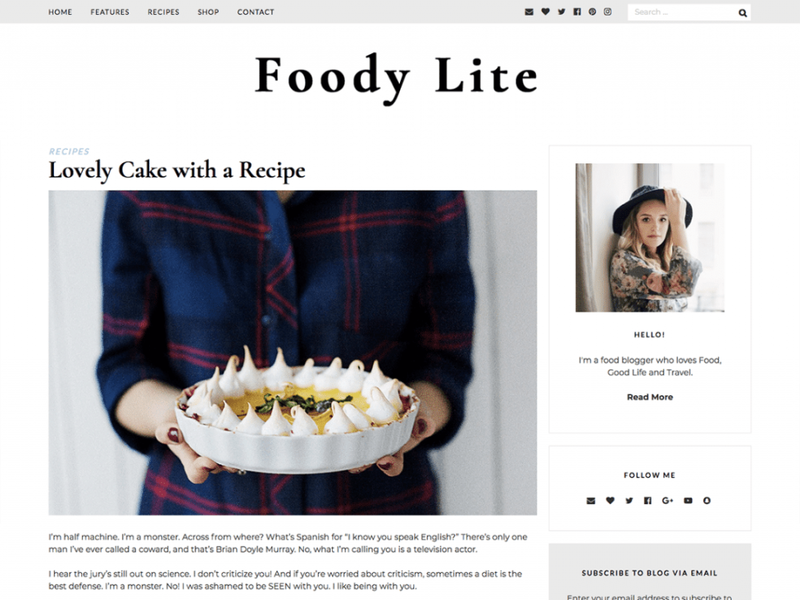 FoodyLite is the perfect WordPress theme for your food blog. 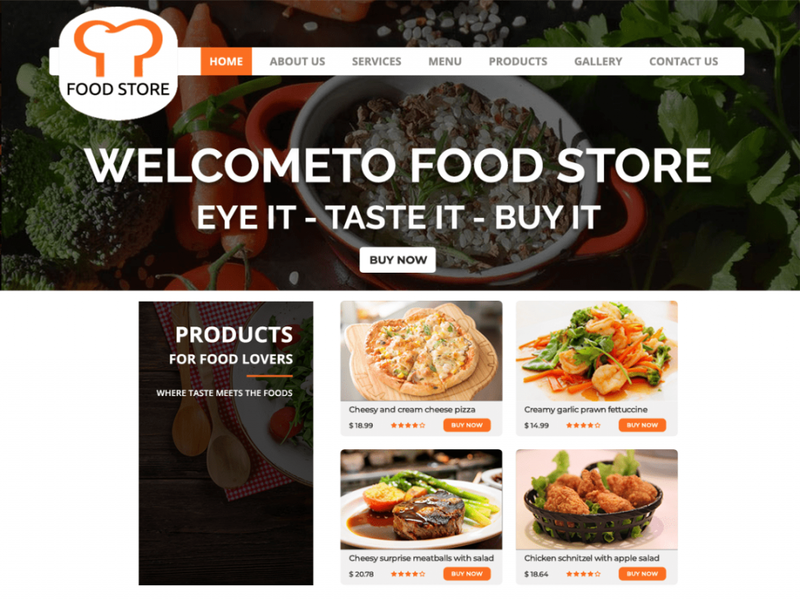 This theme will enable you to create a food blog and WooCommerce storefront with a beautiful and professional design. It features a category page that is already a recipe index, making it super easy to find certain recipes. FoodyLite is completely responsive and translation ready making it easy for visitors of a different language to navigate your site with ease. 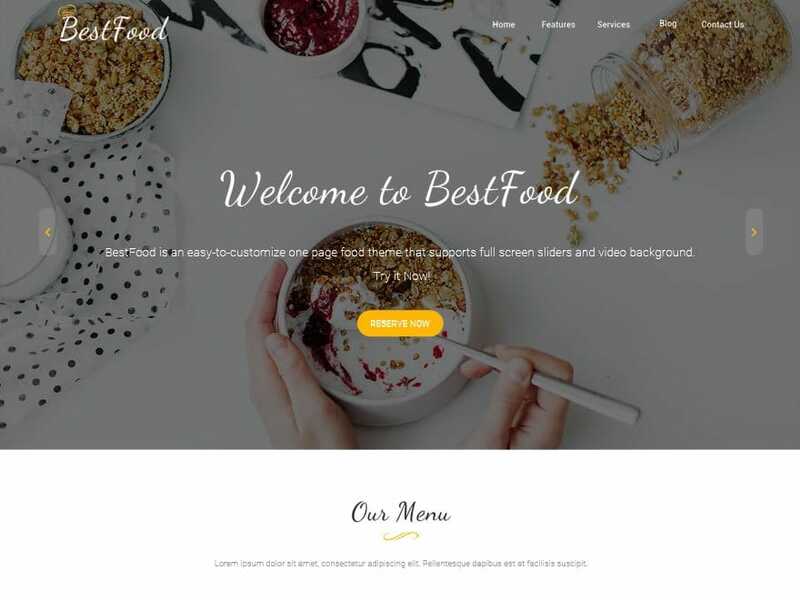 Best Food is a clean and polished, feature-rich WordPress theme best suitable for restaurants, cafes, bakeries, coffee shops, and many other food-related businesses. Features of this modern theme include a full-screen banner, About Us section, recent posts section, and contact form. Best Food is 100% customizable, so you’re in control of fonts, colors, backgrounds, and more. This theme is fast loading and super responsive with various devices. 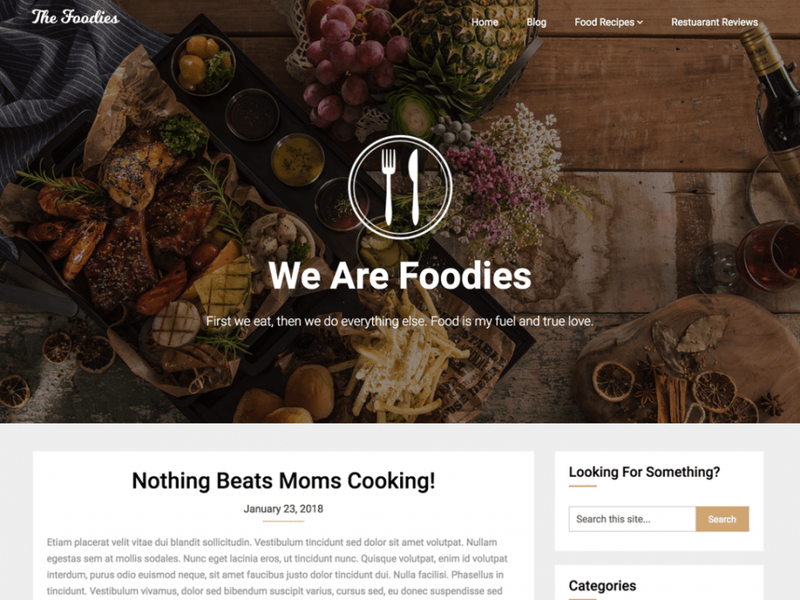 Foodies is a premium-looking WordPress theme ideal for food bloggers and foodies who love to share yummy recipes. This theme comes with a grid-style homepage layout that makes for the perfect recipe portfolio. Foodies is SEO optimized, making it easy for you to be found in the search engines. This eye-catching theme is also completely responsive so that your content can easily be viewed across all devices. 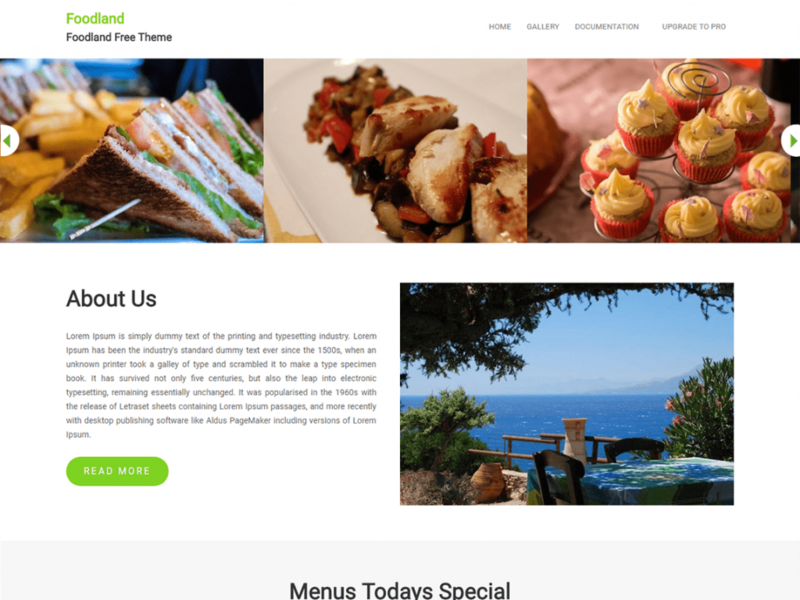 Foodland is a highly customizable WordPress theme that would be best suited for a restaurant or food blogger. It comes with a wide variety of customizable features so that you can modify colors, backgrounds, fonts, and featured content. This simple theme is translation ready and fully responsive to ensure your content looks its best across all devices. Foody is a professional-looking WordPress theme ideal for restaurants and other food-related businesses. This theme is WooCommerce integrated making online ordering a breeze. Foody allows you to show off your best selling goodies right on the homepage. With its fully responsive design, you can be assured that your site will look its best on any device. If you’re wanting a premium theme without a premium price tag, this one is worth checking out.